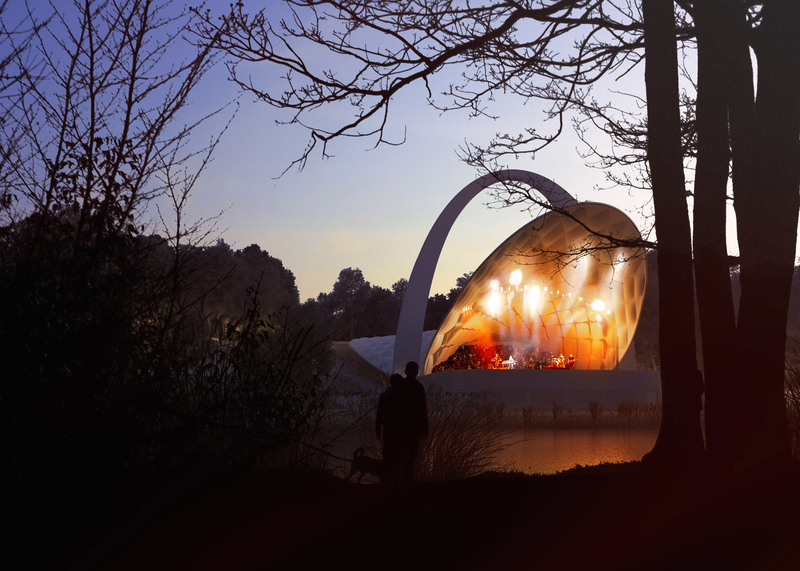 London studio Flanagan Lawrence has won a competition to refurbish an outdoor theatre in Szczecin, Poland, with plans to add an arched roof made from inflatable panels (+ slideshow). 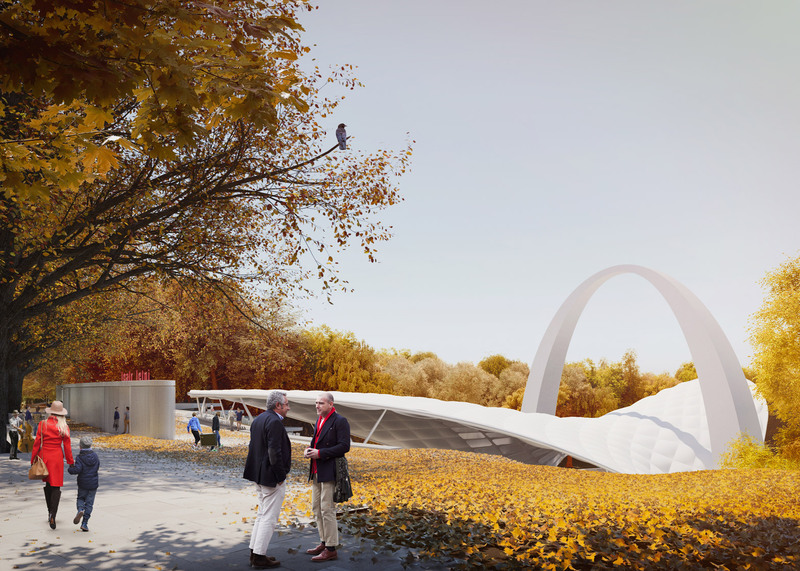 Flanagan Lawrence has designed a tensile structure with two angled and arched openings to envelop the stage and amphitheatre of the Summer Theatre in the city's Kasprowicz Park. This structure will replace the structure's existing zigzagging roof to create a "acoustically optimised enclosure". The original theatre, which features a tall concrete arch and open-air seating, was designed by Polish architect Zbigniew Abrahamowicz and opened in 1976. It is located near the recently completed Szczecin Philharmonic Hall – a concert hall featuring distinctive translucent ribbed glass cladding and a spiky roof, which was the 2015 winner of the prestigious Mies van der Rohe Award. The roof will be structurally independent of the existing arch. It will be formed by a curved truss and filled with a tensile cable-net structure that dips in the centre. 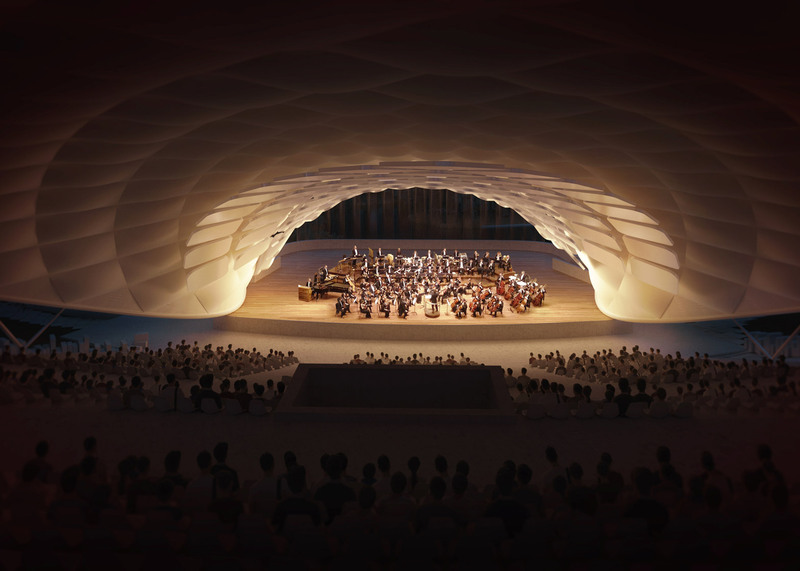 This net will support inflated fabric roof panels and acoustic reflectors, intended to enhance the sound quality during orchestral performances. The curving form echoes the design of a shell-shaped performance space created by the studio for the British seaside town of Littlehampton. 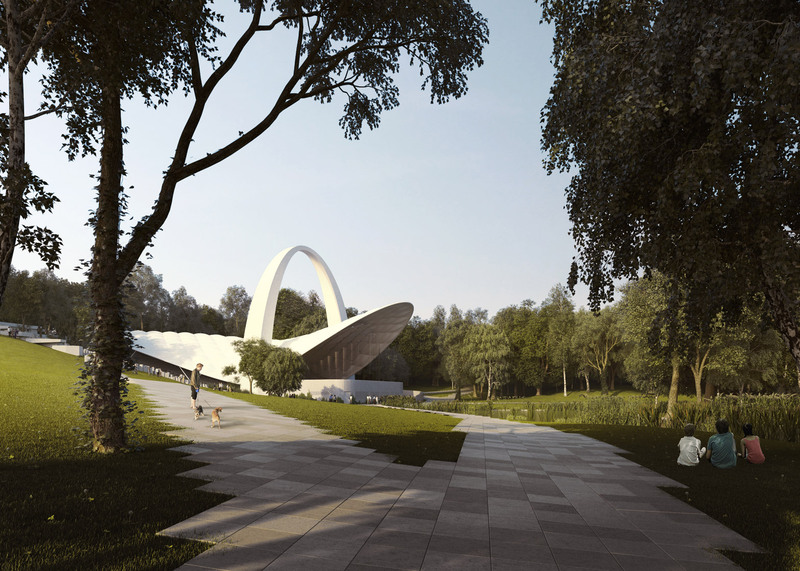 "The doubly-curved roof form follows the natural slope of the amphitheatre on the existing hillside to retain the views across the park, and then dramatically lifts over the stage to provide the necessary height for the performance area," said studio co-director Jason Flanagan. 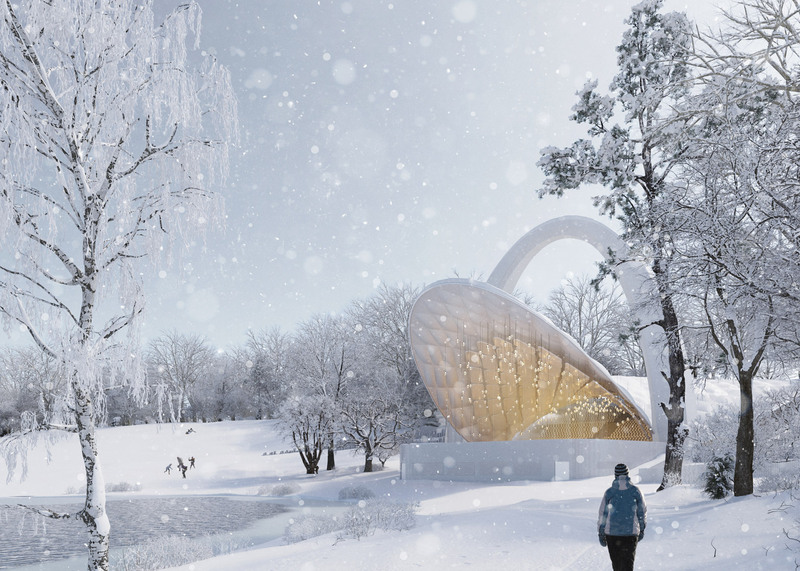 The back of the stage will be enclosed by curved glass screens to provide a picturesque backdrop of the Rusalka Lake during performances. Two additional trusses will span the ceiling above the stage to support lighting equipment. A box office, toilets, cafe and a new backstage area will also be added to the 2,500-capacity structure. It is expected to complete in 2018. Flanagan Lawrence was previously known by the name BFLS, but rebranded in 2013. Other past projects by the firm include the Royal Welsh College of Music and Drama in Wales.